While our yearly calendar begins in January, for many of us, the most intense part of our year actually begins when school starts. Yes, in the Northern Hemisphere, August/September is BACK TO SCHOOL time! And for those who may have been anticipating this month’s CMC to include what we have learned (and still are learning!) about equipping our young adult children to make wise choices, we will be doing that next month. But first we wanted to share some timely thoughts about this current “season” that we trust you will find helpful as well. No matter what our “back to school” date, for most of us, it usually becomes a time when we take stock of what supplies will be needed to successfully complete the academic year ahead such as text books, paper, electronic devices, lesson plans, etc. It also becomes a time to measure growth. How is it that those pants that fit for graduation now need to become capris or shorts, and those feet that have worn sandals (or nothing at all) for the last 3 months can no longer fit into the shoes purchased last spring? This back to school season seems like a good time to take stock, restock, and preserve. Okay, so now you’re feeling pretty good about the kids and their practical needs, but what about the atmosphere in your home? How is the spiritual climate of your home and for you personally? What consideration has been given in balancing sports, clubs and practice schedules with family time? How are you planning to take stock, restock, and preserve? 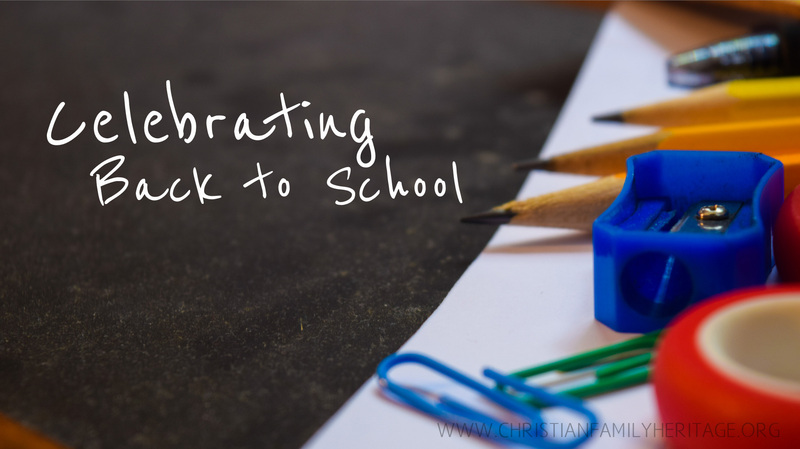 In the midst of back-to-school busyness, it is important for Mom to persevere in order to purposefully and effectively guide both herself and the children through the 2015-2016 year. TAKE STOCK: Answer the following questions: How am I spending my time? What one thing is capturing most of my day? Can it be altered or should it be? Am I resting (really resting) when the littles are resting or if the older children are at school? So often we moms use these quiet moments to catch up on laundry, social media or the latest Netflix series (the latter two can easily become addicting). Please know that these activities in and of themselves are not wrong, and laundry does need to be done. But for the busy mom who isn’t recharging, the consequence usually produces a fatigued mom facing the most demanding time of day — late afternoon into the evening. 1 Corinthians 9:27 provides some wisdom: “I discipline my body and bring it into subjection, lest when I have preached to others, I myself should become disqualified.” Keeping our activities inside the “funnel” should be seen as a good serving the greater good…not a discipline filled with rules, regulations and duty. After all, if we are having difficulty in demonstrating wise time management and self-control, then how can we expect our children to act any differently? It’s the “ripple effect.” If we are prone to melt downs when our lives are thrown a curveball, then we shouldn’t be surprised when our children do not handle transitions well either. So in the process of “taking stock” of material things and your family life, take a moment to evaluate your life as well. RESTOCK: Okay, now let’s think in terms of how we can restock our life on a regular basis. Many of us have been believers long enough to know that if we are not regularly restocking ourselves spiritually, we and our children are missing out. Using a close friendship as an analogy – when there is regular communication, a close friend will have an influence on our life. Patricia says, “I remember a friend who had very healthy eating habits, so when I felt my food habits were getting sloppy I would call her, we would chat about healthy dinner menus and I could feel my resolve to eat better being restored.” In the same way, if we allow long periods of time to lapse between conversations, over time that friend ceases to have the same positive impact she once did. The same concept is true in our relationship with the Lord. If we want to feel His influence in the lives of our children, we need to allow Him to be impacting our lives regularly. In other words, we need to restock our spiritual shelves regularly. Start small. If you are a habitual late riser try backing up your alarm clock in 1⁄2 hour increments, or begin going to bed 15 minutes earlier. Recognize those time wasters. Treat your time as your financial advisor would tell you to treat your money. Keep track of it and know where those precious minutes are going. Time wasters can be anything from a great novel (reading is good right?) or hunting someone down on Facebook. Proverbs 31:27: She looks well to the ways of her household, and does not eat the bread of idleness. So remember, take stock, restock, and preserve/persevere…Your investment into the lives of those God has entrusted into your care is intense but short. Make your Back to School season a life changer for everyone.